" Family owned and operated since 1988"
​ Store Locations in Hartford, WI; and Erin, WI." 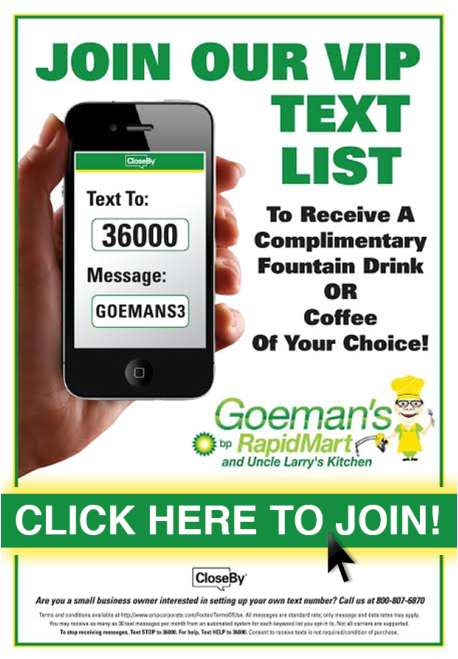 Goeman’s RapidMart has been family owned and operated since 1988 with 2 locations to serve you. We are conveniently located halfway between Hartford, WI and Slinger, WI on Hwy 60 in Hartford, Wisconsin. Our Erin location is on the corner of Hwy 83 & Hwy 67. Featuring: Homemade Potato Salads, Pasta Salads, Uncle Larry’s Homemade Pizza, Deli Meats, Sliced Cheeses, Coleslaw and much more! Fishing and hunting licenses & more!